"Como Lake" and "Lario" redirect here. For the Italian actress, see Veronica Lario. Lake Como (Lago di Como [ˈlaːɡo di ˈkɔːmo], locally [ˈkoːmo] in Italian, also known as Lario [ˈlaːrjo], after the Latin name of the lake; Lombard: Lagh de Còmm [ˈlɑː‿dːe ˈkɔm],[a] Cómm [ˈkom] or Cùmm [ˈkum]; Latin: Larius Lacus) is a lake of glacial origin in Lombardy, Italy. It has an area of 146 square kilometres (56 sq mi), making it the third-largest lake in Italy, after Lake Garda and Lake Maggiore. At over 400 metres (1,300 feet) deep, it is one of the deepest lakes in Europe, and the bottom of the lake is more than 200 metres (660 ft) below sea level. Lake Como has been a popular retreat for aristocrats and wealthy people since Roman times, and a very popular tourist attraction with many artistic and cultural gems. It has many villas and palaces such as Villa Olmo, Villa Serbelloni, and Villa Carlotta. 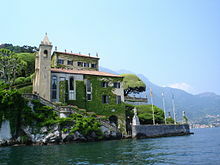 Many famous people have had and have homes on the shores of Lake Como. One of its particularity is its characteristic "Y" shape, which forms the so-called "Larian Triangle", with the little town of Canzo as its capital. 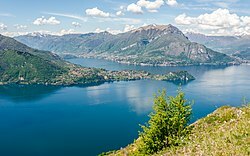 The lake's name in Latin is Larius, Italianised as Lario, but this name is rarely used; it is usually called Lago di Como (literally "lake of Como"). In guidebooks the lake may be variously referred to as Lake Como, Lake of Como, or Como Lake. Its name comes from the city of Como, known to the Romans as Comum. While the city of Como is referred to as Como, the lake is never referred to solely by this name. This is not true of another lake in Italy, Lake Garda, where Garda may refer to either the town fronting the lake, or the lake. The lake is shaped much like an inverted letter "Y". The northern branch begins at the town of Colico, while the towns of Como and Lecco sit at the ends of the southwestern and southeastern branches respectively. The small towns of Bellagio, Menaggio and Lierna are situated at the intersection of the three branches of the lake: a triangular boat service operates between them. Lake Como is fed primarily by the Adda River, which enters the lake near Colico and flows out at Lecco. This geological conformation makes the southwestern branch a dead end, and so Como, unlike Lecco, is often flooded. 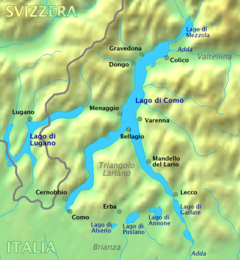 The mountainous pre-alpine territory between the two southern arms of the lake (between Como, Bellagio, and Lecco) is known as the Larian Triangle, or Triangolo lariano. The source of the river Lambro is here. At the centre of the triangle, the town of Canzo is the seat of the Comunità montana del Triangolo lariano, an association of the 31 municipalities that represent the 71,000 inhabitants of the area. 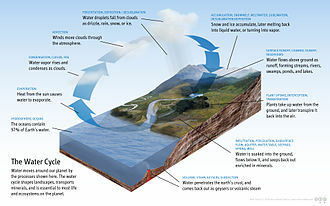 Lake Como weather is humid subtropical (Cfa in the Köppen climate classification). In the winter, the lake helps to maintain a higher temperature in the surrounding region. Average daily temperatures range from about 3.7 °C (39 °F) in January to 23.4 °C (74 °F) in July, according to historical weather data from Como. Water temperatures can reach an average of 24 °C (75 °F) during the month of July. Snowfall is erratic and primarily affects the higher elevations. Rainfall is heaviest in May and lowest during the winter months. Source: "Climate data for Como". Retrieved March 17, 2019. As a tourist destination, Lake Como is popular for its landscapes, wildlife, and spas. It is a venue for sailing, windsurfing, and kitesurfing. In 1818 Percy Bysshe Shelley wrote to Thomas Love Peacock: "This lake exceeds anything I ever beheld in beauty, with the exception of the arbutus islands of Killarney. 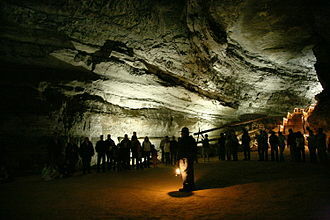 It is long and narrow, and has the appearance of a mighty river winding among the mountains and the forests". In 2018, both a fashion event of the Italian luxury label Dolce and Gabbana and a Netflix production starring Jennifer Aniston and Adam Sandler took place at Lake Como. Argegno is the home and studio village of watercolour artist Paul Wright. He is also the author of the Italian Trilogy series of books. The first book 'An Italian Home’ Settling by Lake Como published in 2011 ISBN 978-1-980522-64-5. The sequel is 'An Italian Village.' A Perspective of Life Beside Lake Como ISBN 978-1-980566-46-5 and the third book is ‘Cats Do Eat Spaghetti’ Living with our Rescue Cats ISBN 978-1-5218-0313-4. The Lake Como waterfront at sunset, Varenna. Villa Carlotta was built for the Milanese Marquis Giorgio Clerici in 1690 and occupies a site of over 7 ha (17 acres) at Tremezzo, facing the Bellagio peninsula. An Italian garden (with steps, fountains, and sculptures) was laid out at the same time. The villa was later sold to powerful banker and Napoleonic politician Giovanni Battista Sommariva. 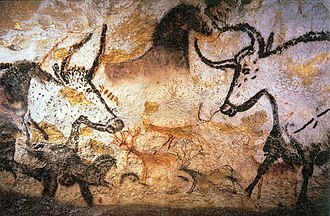 Stendhal was his guest in 1818, and his visit is recalled at the start of La Chartreuse de Parme. In 1843 it was purchased by Princess Marianne of Nassau as a wedding present for her daughter Carlotta, after whom the villa is now named. The latter, together with her husband Georg II of Saxen-Meiningen, laid out the woodland landscape park in Romantic style. The villa today includes a museum of agricultural implements as well as important works of sculpture by Sommariva's friend Antonio Canova and by Luigi Acquisti. Villa d'Este, in Cernobbio, was built in 1568 by Cardinal Tolomeo Gallio, a native of the town. In 1816–1817 the villa was home to Caroline of Brunswick, estranged wife of the Prince of Wales and shortly to become Queen Consort of King George IV of the United Kingdom. The landscaped gardens in the English style are a product of this period. Later in the century it was turned into a luxury hotel. Today the Villa d'Este is known for attracting celebrity guests. Villa Serbelloni, also in Bellagio, hosts the Rockefeller Foundation Bellagio Center, a 50-acre (200,000 m2) international conference center set up and managed by the Rockefeller Foundation since 1959, which also operates a "scholar-in-residence" program for scholars from around the world. This is believed to have been the site of Pliny the Younger's villa "Tragedia". Its well-known park was created at the end of the 18th century by Alessandro Serbelloni. 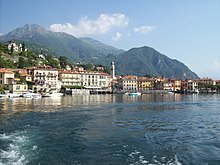 The Lake Como ferry service is a highly developed public transport system linking the many small towns around the Lake. A motorized service began in 1826 when a steamship with sails, the "Lario", was launched by the newly established Società privilegiata per l'impresa dei battelli a vapore nel Regno Lombardo Veneto. Since 1952 the system has been run under the auspices of a government organization called first the Gestione Commissariale Governativa and subsequently the Gestione Governativa Navigazione Laghi, which is also responsible for services on Lake Maggiore and Lake Garda. Motorship services along the western branch and northern end of the Lake (between Colico or Piona and Como town), with additional shuttles to the mid-lake area. Fast services that follow broadly the same route, but use faster hydrofoils, stop less frequently, and cost extra. Ferries that run only between the popular mid-lake villages of Menaggio, Bellagio, and Varenna, plus Cadenabbia. Some of these boats carry vehicles as well as passengers. The Sacro Monte di Ossuccio ("Holy Mount of Ossuccio") is a sanctuary located on a hillside slope between olive groves and woods along the western edge of Lake Como facing Isola Comacina. Fifteen Baroque inspired chapels, built between 1635 and 1710, and dedicated to the Mysteries of the Rosary are dotted along the way that leads to the Monastery. This building is the last in the chain and is dedicated to the Coronation of the Virgin. In 2003, the Sacri Monti of Piedmont and Lombardy, including that of Ossuccio, were added by UNESCO to the World Heritage List. Ernst Stavro Blofeld retreats to a "metropolitan hotel" on Lake Como after his plans are foiled by James Bond in the novel On Her Majesty's Secret Service by Ian Fleming. 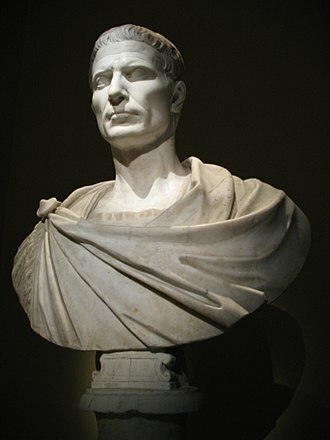 Gaius Catullus asks his friend Caecilius to depart from Lake Como to Rome in poem 35. 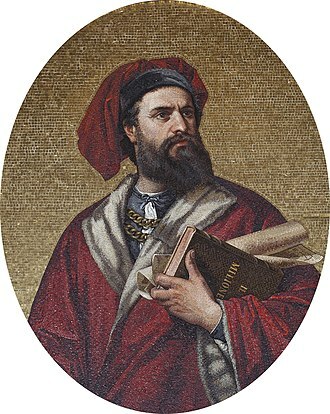 Paul the Deacon, a Lombard grammarian and poet of the 8th century, wrote one of his better known poems in praise of Lake Como (Versus in Laude Larii Laci). Alessandro Manzoni chose to start his The Betrothed with a graphic description of Lake Como. 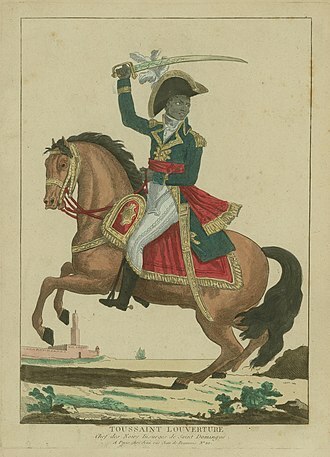 Fabrice del Dongo, the protagonist of The Charterhouse of Parma by Stendhal, is born and raised near Lake Como. Mark Twain visited Lake Como in the summer of 1867. 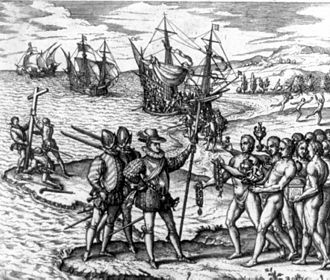 He describes the lake and its environs at length in The Innocents Abroad, which recounts a lengthy pleasure excursion to Jerusalem. 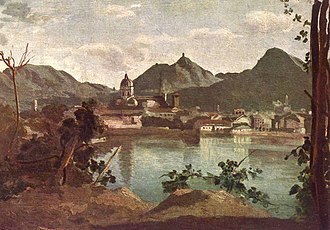 In The Last Man, the 1826 novel by Mary Shelley, Verney and his companions summer in a villa at Lake Como. The lake is referenced by Jean in August Strindberg's magnum opus play Miss Julie. Ernest Hemingway's character Lieutenant Henry in A Farewell to Arms talks about taking a vacation to Lake Como. Nagg and Nell recollect rowing out onto Lake Como the day after their engagement in Samuel Beckett's play Endgame. Cadenabbia on Lake Como is the principal setting for Gladys Theodora Parrish Huntingdon's novel Madame Solario. Maria Ruskin, a character in Tom Wolfe's Bonfire of the Vanities, escapes from New York City to Lake Como, in order to spend time with Artist Filipo Chirazzi. Lake Como was used as filming location for movies such as The Pleasure Garden (1925), Bobby Deerfield (1977), A Month by the Lake (1995), Star Wars: Episode II – Attack of the Clones (2002), Ocean's Twelve (2004), Casino Royale (2006), and Imagine You & Me (2016), and for the music videos Gwen Stefani's "Cool" and John Legend's "All of Me". In television, it was also used as a set for the Chuck episode "Chuck Versus the Honeymooners". In Series 21 of the British television series Top Gear, Richard Hammond races around the perimeter of the lake in an Alfa Romeo 4C while Jeremy Clarkson uses a Gibbs Quadski. In the daytime drama The Bold and the Beautiful, Stephanie Forrester (Susan Flannery) tossed long-time rival Sally Spectra (Darlene Conley) into Lake Como after Sally tries to prevent Stephanie from getting to her own wedding. It was also the setting for a scene in Season 5; Episode 2 "Greyson Blaise" of The Blacklist (TV Series). Lake Como is the setting of the annual Classic cycling race, the Giro di Lombardia (Tour of Lombardy). Lake Como seen from Villa Carlotta in Tremezzo, near the centre of the lake. Lake Como seen from the city of Como. ^ a b c d e "Laghi italiani". Istituto Italiano di Idrobiologia. Retrieved 2006-11-17. ^ "The World's 20 Most Beautiful Lakes". The Huffington Post. 2014. Retrieved 22 May 2017. ^ The meaning of Larian is "related to the Lake Como", since the Latin name of Lake Como was Larius. So, the expression Triangolo lariano, or, in English, Larian Triangle, means exactly "Lake Como Triangle" or "Triangle of the Lake Como". ^ "Climate data for Como". ^ Francis W Halsey, ed. (1914). Seeing Europe with Famous Authors. VIII. Funk & Wagnells. ^ "Directly from the producer - Lago di Como". www.lakecomo.it. ^ See Infoparchi, Villa Melzi. ^ "Lifeinitaly.com". Archived from the original on 2009-11-06. ^ Massimo Gozzi, "History of Navigation on Lake Como" Archived 2009-10-15 at the Wayback Machine, Gestione Governativa Navigazione Laghi, 2007, pp 1–2. ^ "General Management" Archived 2010-05-05 at the Wayback Machine, Gestione Governativa Navigazione Laghi, 2007. ^ "'Autumn Timetable 2009' Gestione Governativa Navigazione Laghi". Archived from the original on 2010-03-16. ^ In isolation, lagh is pronounced [ˈlɑːk]. Lierna is a comune in the province of Lecco in Lombardy, in north-west Italy. It lies on the shore of Lake Como, about 60 kilometres north of Milan. It has an area of 11.3 km² and has twelve frazioni, Casate, Cisarino, Giussana, Grumo, La Foppa, Olcianico, Sornico, at the end of 2014 the population was 2176 people, in 983 families. Lierna borders the comuni of Esino Lario, Mandello del Lario, Oliveto Lario, the first mention of Lierna dates to 854 AD, but Roman remains, including a mosaic floor now in the Palazzo Belgioioso of Lecco, attest to much earlier settlement. The name of the village may be of Roman or of Celtic origin, between 1035 and 1202 it was a feud of the Monastery of San Dionigi in Milan. 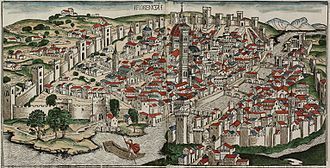 Lierna was contested between Milan and Como, and between the Della Torre and Visconti families and it passed into the hands of the Marchesino Stanga in 1499, and in 1533 to the Sfondrati family of Cremona, who held it until 1788. Lierna became a comune in 1743, when it was separated from that of Mandello, in 1927 the Milanese sculptor Giannino Castiglioni opened a studio at his house in Lierna. Veronica Lario is a former Italian actress and the former wife of Italian Prime Minister Silvio Berlusconi. Born in Bologna, Lario was an actress in low-budget films and she worked in theatrical plays with well-known actors, she retired from acting after meeting Silvio Berlusconi. Married on 15 December 1990, Berlusconi and Lario have three children together, Barbara Berlusconi and Luigi, as the wife of the Italian premier, Veronica Lario has chosen to maintain a low public profile. 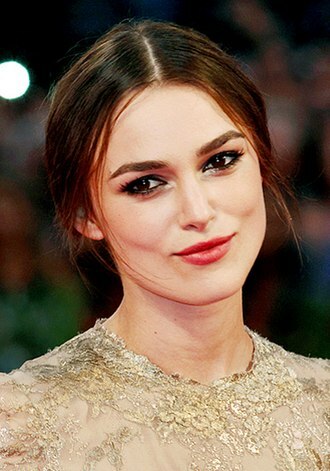 She has avoided most public events and meetings and she accompanies her husband Silvio Berlusconi at official meetings. On the other hand, she has known to have publicly expressed political opinions contrasting with those of her husband. Larios husband was never shy about mentioning her on public occasions, on 31 January 2007, Lario said her dignity had been damaged by comments Berlusconi reportedly made during the VIP party after a TV awards ceremony broadcast by one of his channels. If I werent married I would marry you immediately, the 70-year-old media mogul told showgirl and future parliamentarian Mara Carfagna and he reportedly told another, With you, Id go anywhere.